There isn’t anything too surprising in this map. Note that the differences are actually rather small in reality: full white corresponds to 10.5 jobs created/saved per 1000 people, while full red corresponds to 15 jobs. One might also note that ~12 jobs per thousand sure doesn’t sound like a lot. I only have data job creation forecasts, not tax cuts, education benefits, or extended unemployment benefits, as were in the map that showed proposed legislation. I would like to also show the number of jobs that have been lost in the district over the past year, or the “GNP” (what’s the term for states or congressional districts? ), but I don’t have that information. 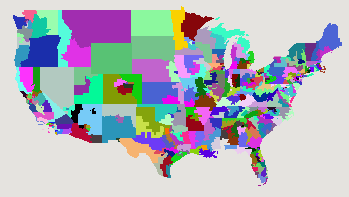 In order to make this map, I needed to load up the geometries for the US congressional House districts, and I found that interesting. I had expected to see really strangely-shaped districts, but by and large they looked pretty reasonable. It might be that the districts with most extreme gerrymandering are in urban areas, and hence too small to see easily. 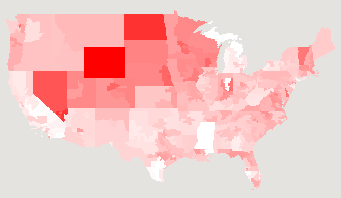 Rural areas have much more uniform demographics, so there is less incentive to draw bizarre shapes. Update: the data that I’d gotten with the US congressional representatives was incorrect, so the picture I had at first in this post was wrong. I’ve updated the data file and the picture.